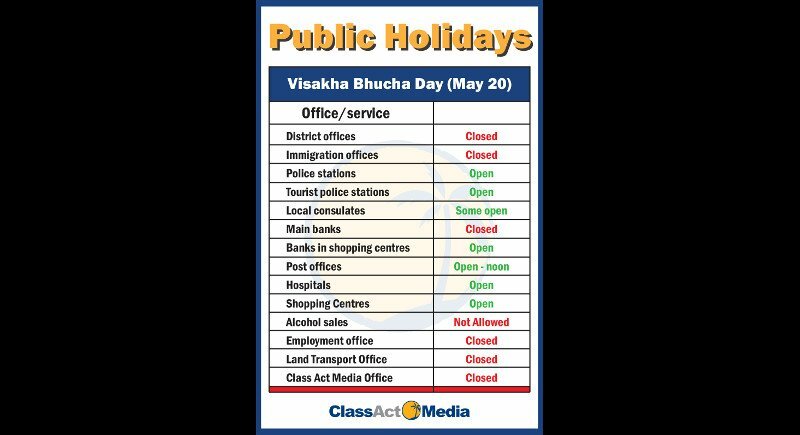 PHUKET: Visakha Bucha Day is around the corner which means most of government offices will be closed on this auspicious day and because it is a holy day, shops, bars and restaurants are barred from selling alcohol for 24 hours from midnight on Thursday night. Visakha Bucha Day falls on Friday, May 20 this year, when Buddhists all over the world commemorate three great events on this full moon of the sixth lunar month: The birth, enlightenment and the passing away of Gautama Buddha. Devout Buddhists will rise early and go to temples to make merit and listen to sermons on the Buddha’s teachings. After sunset, candle-lit processions will take place at major temples throughout the country. The devout Buddhists walk three times around the principle chapel clockwise, each clasping three incense sticks, a lighted candle and lotus buds. The air is filled with burning incense and smoke from the candles as the faithful complete this most sacred of Buddhist celebrations. On this day, most government offices on the island will be closed, including Phuket Immigration Office, the Employment Office, the Land Transport Office and the island’s three District Offices . All main bank branches will be closed, but branches in shopping centres will remain open. All Royal Thai Police and Tourist Police stations will remain open and some local consulates will be open to serve their respective citizens. Visakha Bucha is a Buddhist holiday, so across the country, alcohol sales is prohibited except at duty-free shops at the airport. Joe12- This wasn't about abiding by the law, it was about whether people agreed with the law. I'd wager 99% of Thais agree that there should be a law against murder. Like you, I have no stats, but would be very surprised if more than 20% of Thais agree with a law banning alcohol. Stegee I was the one who criticized a certain patriarchal religion specifically, dictating moral codes and bleating fantasies to everyone while  relegating women to maids who'll fix the meals and clean the temple. You want peace in the world- get rid of the (relatively) new daddy religions and bring back the mother. Worship planet Earth, at least she's real. robertd... it's just like any other law... take murder for instance. It's the law but people still kill one another. Exceeding the speed limit is an offence but we still exceed it. Therefore what is your point? ... nothing. Check stats yourself it's not an assertion as you allege. What I find amusing is that in my 20 years in Thailand, I haven't met many budhhists who agree with or abide with this silly law. But they all know where to go that is not required to comply with the ban. Not sure where joe12 comes up with his 95% assertion. Stegee... sure.."What is justifying a total alcohol ban on a Buddha day on Phuket...Let the Buddhist ban themselves." @joe12- could you point out where kurt has 'rubbished' buddha or buddhists or buddhism? have you conducted a survey of these '95%' to ask them their opinion? yvonne, MISUSE  of Capitalization does  NOT Make  A WEAK POINT STRoNGer, BUT It Sure DOES MAKE  any Point more ANNOYING! Joe112, I disagree with religious rules being enforced on a general population- but I cannot simply evaporate into outer space and must remain on the earth, preferably in a country where there are groceries. Kurt, plain and simple. FIOFO.Are you a reincarnation of Sue from PW days? Kurt..don't know why you repeating your silly questions, which have already been addressed, but I suppose you are either thick, dumb or stupid to understand. Kurt, just another example how patriarchal religions have to control everyone. Many counties in USA will not sell alcohol on Sundays for the same old goat reasons. Please somebody, stop the bleating!! I don't understand the total addiction to alcohol and not being able to go without for one day, if you are so addicted buy the day before, it\'s not rocket science! I don't understand the total alcohol ban on Phuket during Buddha Days. --: In Thailand, State and religions are separate. Buddhisme is not a State religion. --: On Phuket is about 30 % of the population Muslim. --: There are many foreigner living on Phuket who are not Buddhist. --: There are may tourists on Phuket who are not Buddhist.